Posted on Thursday, May 10th, 2012 at 7:00 pm. 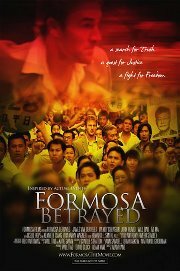 Come join the Central Texas Chapter of the Formosan Association for Public Affairs (FAPA) at their sponsored screening of the 2009 award winning independent film “Formosa Betrayed,” which highlights the ongoing struggle of Taiwanese people to maintain their identity and right to determine their own destiny separate from the orbit of authoritarian and hegemonic China. After screening the 104 minute film, there will be a Q&A session chaired by local FAPA chapter president, Timothy Bradberry. Special thanks to Rep. Jason Isaac (R-HD47) for serving as the event’s Texas House sponsor. Will this be play in San Francisco Bay Area?